As new hybrids surfaced and as the demand for coffee increased, the cultivation shifted from shade to plots in direct sunlight. This "sun" coffee has different requirements than shade-grown, and as result, tastes differently. More than taste, however, there are plentiful other reasons to love shade-grown coffee. 1. Shade grown coffee tends to be healthier. Shade-grown coffee is the equivalent of free-range chicken, pastured beef, heirloom vegetables: free from chemicals that boost productivity but compromise quality. If you'd like to go organic all the way to your coffee, shade grown coffee is an excellent choice, not only in terms of the product's quality, but also in terms of its (low) impact to the environment in terms of carbon emission, soil erosion and polluted water runoff. 2. Shade grown coffee helps maintain wildlife habitat. Since there is no need to clear the forest to produce this variety of coffee, forest cover is maintained. The existing wildlife population dependent on this forest cover is not displaced and even benefit from the additional source of food and shelter that coffee plants provide. Consequently, shade grown coffee promotes rain forests to thrive as they are since there is no competition from them for sunlight. 3. 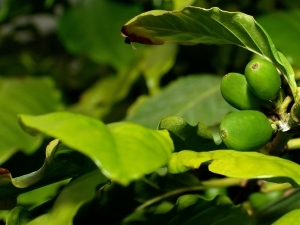 Shade grown coffee helps push the income of farmers up. Shade trees cannot only be harvested for timber when thy mature, they also provide fruit and fuel while they grow. These by-products, in turn, give farmers another stream of income while waiting for the coffee cherry to mature. 4. Shade grown coffee helps reverse the chemical-dependent trend. While there is often a transition period when a certain degree of chemical application is required, once coffee farmers have made a complete shift to shade grown coffee growing and have learned to cope with the demands of this organic method, there is very little incentive to slide back to the old practice. 5. Shade grown coffee often tastes better. This is because growth under the canopy slows down the maturation period of the cherries resulting to increased levels of natural sugars that enhance the flavor of the beans.